Expired 8mo ago . Last validated 11mo ago . Used 2 times. Nelson Mendoza I am validating this deal and it works as described. Only enter the promotion code at checkout to receive the discount. 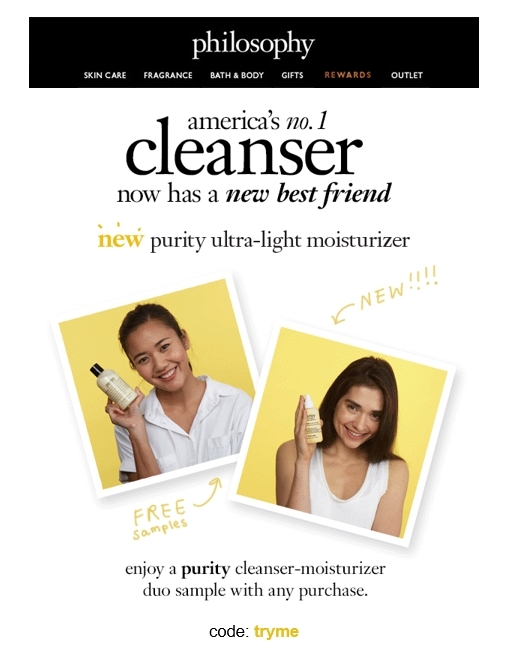 Jose Santiago enjoy a free purity duo sample with any purchase on philosophy.com. add purchase to cart and enter offer code "tryme" to redeem. offer only valid from may 3 (12:01am edt) to may 6 (11:59pm edt), 2018. while limited supplies designated for this offer last. no refund available if gift not returned with purchased product(s). 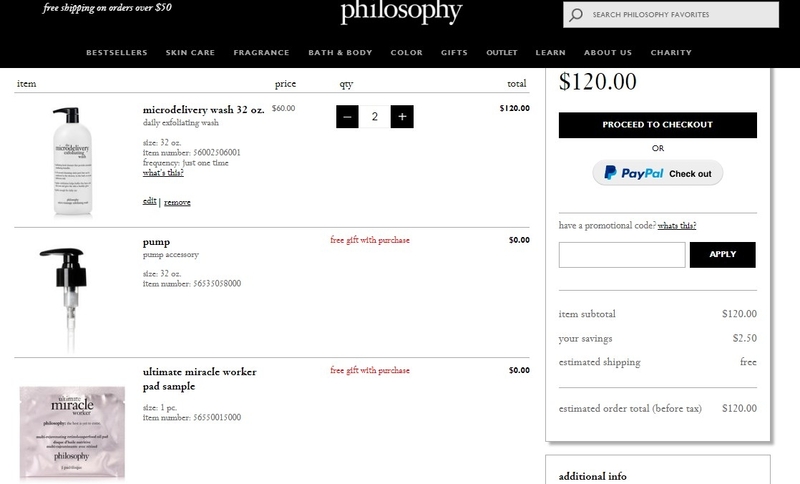 offer available to residents of u.s. and u.s. territories only and only to purchases on philosophy.com; purchases from our offline store don't qualify. applicable purchase amount does not include items not in stock at time of purchase; items not designated for offer; pending purchases or purchases made before or after the offer period; or any fees or costs, such as cost of shipping, handling, and sales tax. one offer per customer. offer cannot be combined with any other promotion, sale, or discount. we may cancel or change this offer or cancel your order without notice due to insufficient supply, your noncompliance with offer terms, lack of bank authorization, system error, unforeseen problems, or for any other reason. other restrictions may apply. 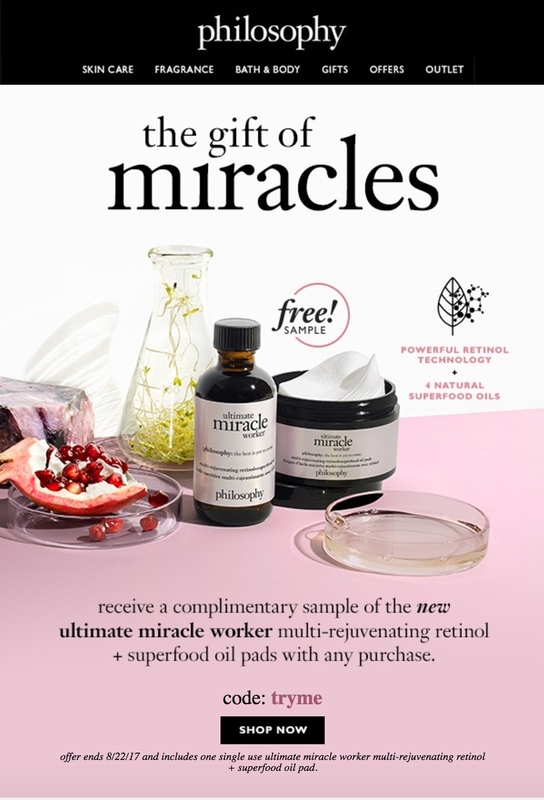 Jesus Complimentary Ultimate Miracle Worker Retinol Pad Sample With Any Purchase at Philosophy. This deal works as described. This offer is still valid. It works perfectly, the promo code works very well. Howard Cardona This deal works as described. Select the product you are going to buy, look for the coupon promotion box, paste the coupon, verify that the code is still working and then make your purchase. 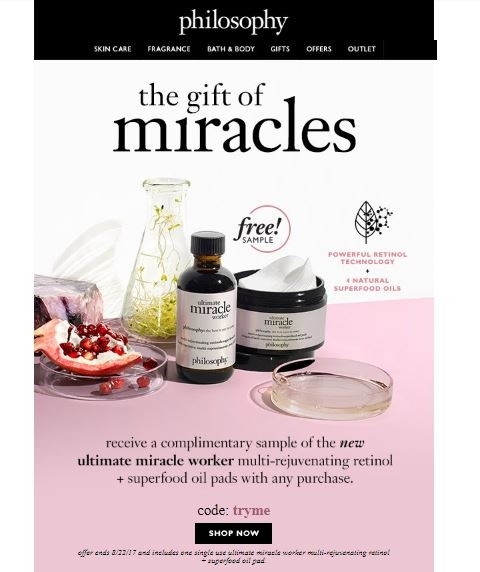 Mayerlin Benevento Offer ends 8/22/17 and includes one single use ultimate miracle worker multi-rejuvenating retinol + superfood oil pad. Vicki Floyd This deal has been updated to add the freebie button and to correct the expiration date. See screen shot below. 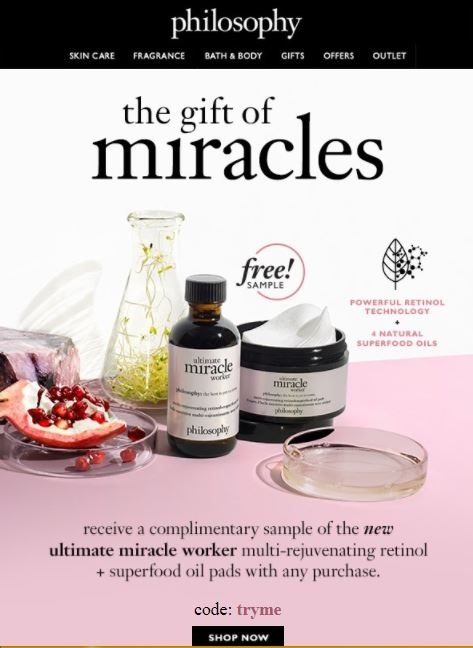 Charles Fields Offer ends 8/22/17 and includes one single use ultimate miracle worker multi-rejuvenating retinol + superfood oil pad. 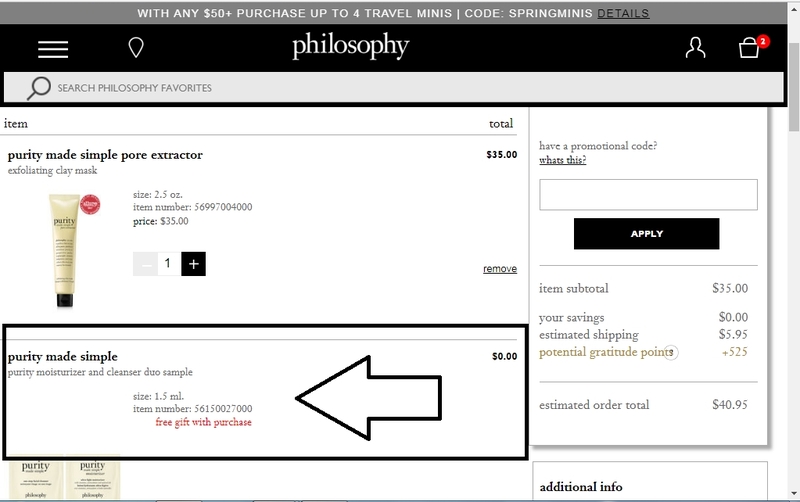 Tiffany O Enter the promo code "tryme" at the Philosophy checkout online. This offer is valid for a limited time only.